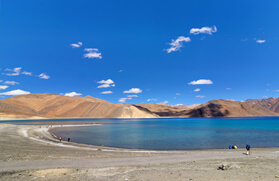 From Delhi, take the early morning train to Haridwar, the gateway to the four pilgrimages and later drive to Rishikesh. On arrival check in to hotel. Post - lunch half day sight seeing. Visit temples, Ashrams, Yoga centers, Ram and Lakshman Jhulas, the largest suspended bridge in India. Overnight stay. 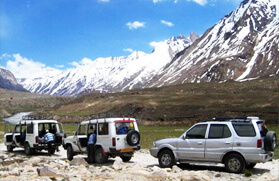 Drive by jeep from Rishikesh to Joshimath (8 hrs) along the Ganga and the Alaknanda rivers. Later take a 3.9 km cable car (the longest in Asia) to the scenic and picturesque Auli Ski Resort catching excellent views of the Garhwal Himalayas including Nanda Devi. Overnight stay will be at Auli tourist bungalow/Joshimath hotel. 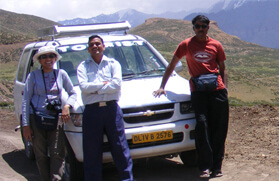 Drive from Auli to Tapovan passing Joshimath where the statue of Narsingh is carved out of a single semi-precious stone. 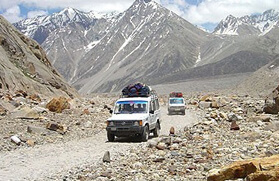 Drive to Reni to see the sulphur springs and return back to Auli. Overnight stay at Auli Tourist Bungalow/Joshimath Hotel. 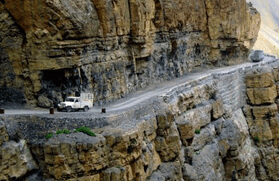 Drive to Badrinath (2 hours) situated on the banks of Alaknanda and catches a glimpse of the Nar and Narayan Parvat and the Neelkanth peak (6597 m). In the lap of Narayan Parvat is the famous Hindu shrine of Badrinath (3110 m) dedicated to Lord Vishnu. Drive back to Auli via Joshimath. Overnight stay will be at Auli Tourist Bungalow/Joshimath Hotel. Drive from Auli via Joshimath to Dogalbitta (4 hours) at 2347 m. It is a high altitude alpine meadow with great views of the Himalayan ranges. Overnight stay will be in a camp at Doggalbitta. 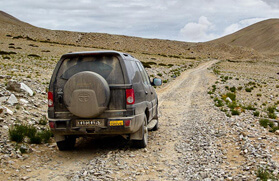 Drive from Doggalbitta to Chopta (7km) and then 3.5 km hike to Tungnath Temple (13,500 ft) set on the crest of a hill at a height of 3680 m. See breathtaking views of Panch Chuli, Nanda Devi and Kedarnath and a panoramic view of the Garhwal Himalayas. Come back to Doggalbitta Camp for overnight stay. 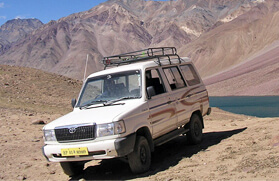 Drive from Doggalbitta to Uttarkashi (8 hours) on the banks of the Bhagirathi. A place to view historical monuments, temples, ashrams and dharamshalas. 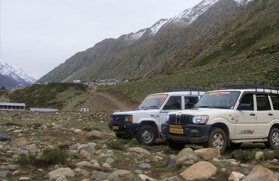 Overnight stay will be at a guest house in Uttarkashi. Early morning embark on the 97 km drive from Uttarkashi to reach Gangotri, the source of Ganga River (4 hours). A scenic drive along the ancient pilgrimage route. Overnight stay in tents near Gangotri. 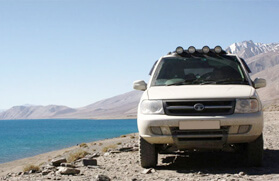 A day for local trekking, sightseeing. 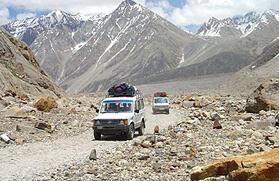 In the morning, trek around the area, have a picnic lunch and trek back to Gangotri Camp for overnight stay. An early morning drive to Mussoorie (1921 m), a hill station. 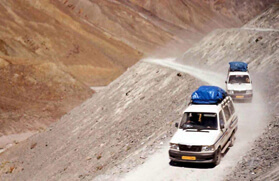 Mussoorie is known as the Queen of Hill Stations. 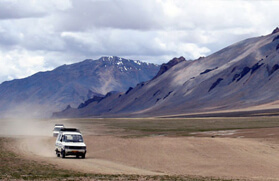 Visit the famous gun hill where one can get panoramic views of snow clad Himalayas. Overnight stay will be at hotel in Mussoorie. 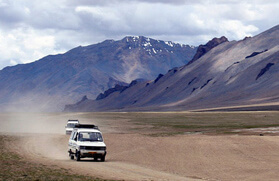 A half day for sightseeing, easy walks along the pine scented Happy Valley and the Tibetan township. View the cliff hung Buddhist shrine with ceremonial trumpets and acolytes reciting ancient scriptures. From there, a short drive to Dehradun to board the Shatabdi Express to Delhi. After arrival at Delhi Railway Station, Swagat Tours Representatives will assist you transfer to the hotel. Transfer to airport to catch onwards flight according to your flight schedule.